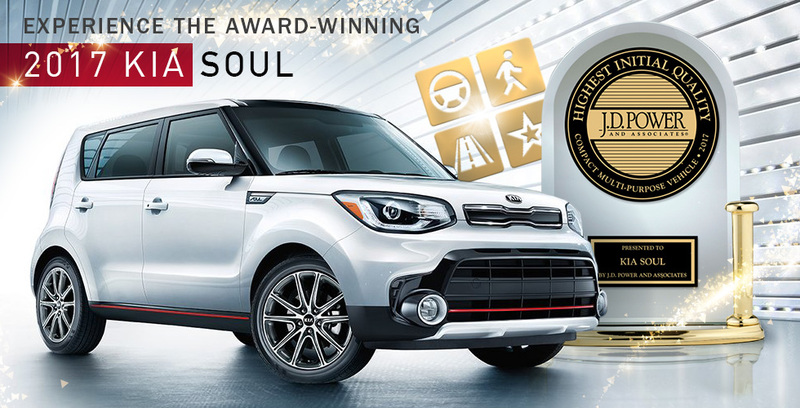 The 2017 Kia Soul is an award-winning sub-compact that has the features everyone wants in a fun stylish package! Test-drive your 2017 Kia Soul at Crown Kia Dublin today! The 2017 Kia Soul may be a sub-compact, but it's packed with enough features to fill an SUV! It's made to keep passengers entertained and drivers focused on long trips and daily commutes. In short, it's a great, unexpected choice for your next family car! In fact, U.S. News & World Report recently named the 2017 Kia Soul Best Compact Car for Families. The 2017 Kia Soul delivers big style and big value! Made with versatility in mind, the Soul comes in 3 available engines so you can choose the Soul that fits your lifestyle. Pick the available 1.6L I-4 turbocharged engine for powerful performance. It produces up to 201 horsepower while staying fuel efficient on the roads of Dublin! Or choose the 2.0L I-4 and get 161 horsepower an EPA-estimated 30 MPG on the highways of Ohio! If you want a mix of performance and fuel efficiency, go with the 1.6L I-4 engine that comes standard. Drive with added peace of mind knowing that the award-winning Kia Soul is designed with to keep you and your family safe. Test-drive the 2017 Kia Soul today at Crown Kia Dublin! *The Kia Soul received the lowest number of problems per 100 vehicles reflecting higher quality among compact multi-purpose vehicles in the J.D. Power 2015-2017 U.S. Initial Quality Studies. 2017 study based on 77,419 total responses, evaluating 189 models, and measures the opinions of new 2017 vehicle owners after 90 days of ownership, surveyed in February-May 2017. Your experiences may vary. Visit jdpower.com/cars. **The winners were handpicked by KBB.com Editorial staff based on two critical factors -- fun-to-drive and fun-to-own. The editors freely admit that the subjective "cool factor" is the over-arching number-one criterion for a vehicle to place on this list. Each vehicle is available for purchase at $18,000 or less, using Kelley Blue Book's exclusive Fair Purchase Price as the yardstick. For more information, visit Kelley Blue Book's KBB.com.